I will write details at length in later posts, however these few words record the walk between Risdon Cove and half way into Old Beach happened amidst spitting rain, strong breezes, gloomy clouds across the northern suburbs, beautiful vistas across the Derwent River, rich native bushlands and bird wandering wetlands, the sunken remains of historic boats, interesting people met along the way, new angles on the mountain (Mt Wellington), and reliable bus services. I was away from home for around 6 and a half hours, walked about 14 or so kilometres, and covered an extra 8 kms of the Derwent River as it snaked around the suburbs (different from its straight run out to sea on previous walks). All up, I have now covered approximately 34 kilometres of the Derwent River, and the walking experience continues to inspire me. 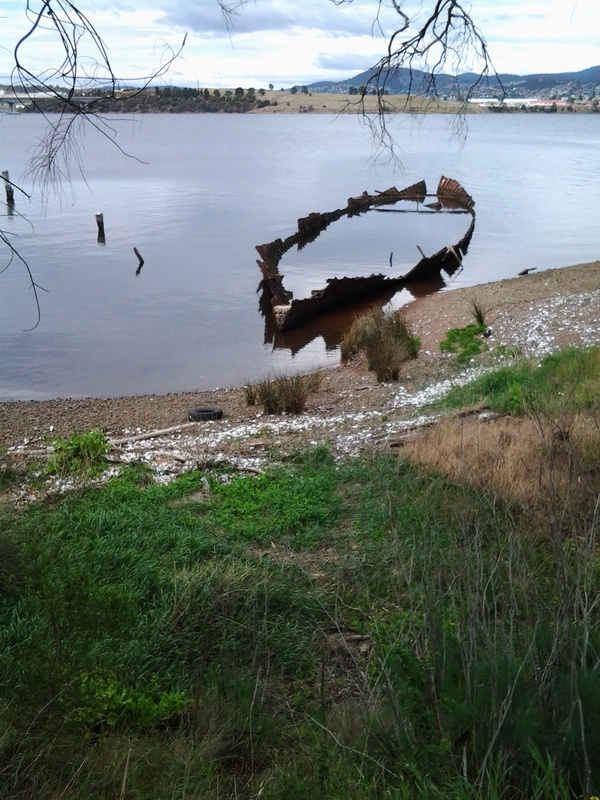 The photo below shows the sunken remains of the ship Otago. Notice the calm waters of the Derwent River. Sensationally beautiful. Through the branches on the top right of the photo is the blue shape of Mount Wellington. Only when I looked at this photo and registered the relatively small size of our mountain, did I truly understand the distances I have walked from the mouth of the river to this spot on Otago Bay. In the beginning, I was south of the mountain and now I am north. There will come a time when I can no longer see the mountain as I walk along the Derwent River. This entry was posted in Derwent River, Hobart, Mount Wellington, Walking and tagged Derwent River, Old Beach, Otago, Otago Bay, Risdon Cove, the mountain on November 1, 2014 by Tasmanian traveller.